Chichicastenango Market Tour: Tour guide, lunch. Permanent Guide or bilingual drivers. Chichicastenango market only in Thursday and Sunday. Itinerary may vary depending of your day of arrival. One child is allow in the room sharing with his parents. For quote to this program but with different hotels ask to Gray Line Guatemala. When you arrive in Guatemala City, your guide will greet you at La Aurora International Airport (GUA) or the bus station and transfer you to your hotel in Antigua Guatemala. This charming colonial city once served as the heart of Central American economics, politics and religion and has been named a UNESCO World Heritage Site. Here, you can relax for the rest of the day and prepare for the exciting trip ahead! After a hearty breakfast at your hotel, embark on a half-day walking tour of Antigua with your group. 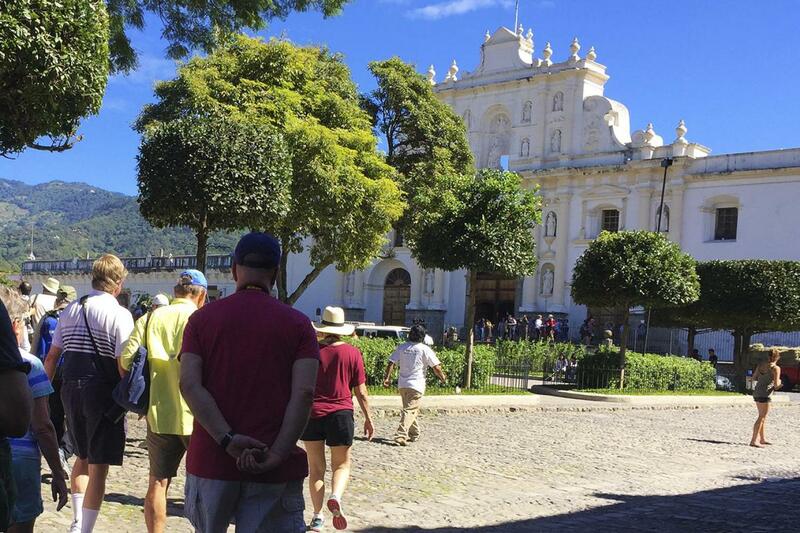 Your guide will take you to see the top attractions of the city, referred to as Antigua Guatemala (Old Guatemala City) after earthquakes destroyed many of its buildings in 1773. Your 3-hour expedition takes you to Parque Central (Central Park), where churches and government buildings surround the city’s main square. You’ll find benches shaded by leafy trees, in the center of which stands the Fountain of the Sirens – a 1936 copy of the 18th-century original. Here, watch the square come to life with shoeshine boys, musicians and vendors. Visit the tall, whitewashed main cathedral that dominates one side of the square; your guide will show you the section that was rebuilt from the rubble. See the Palacio del Ayuntamiento, which houses the city’s municipal offices and museums, such as the Museo de Armas de Santiago and the Museo del Libro Antiguo (Antique Book Museum). The Palacio de los Capitanes Generales stands opposite, near the arcade of cafés, banks and shops known as the Portal del Comercio, where you can browse for brightly colored textiles. Finally, visit the Baroque-style La Merced Church to see Antigua’s largest fountain, Nuestra Señora de la Merced, as well as the imposing San Francisco el Grande church. Returning to your hotel in the afternoon, you’re free to purchase lunch and do as you’d like for the rest of the day. Visit on a Thursday or Sunday to see the K'iche' Maya and people of other dialects from the surrounding region gather. Your guide will help you navigate the market, where vendors sell everything from produce, grains and animals to colorful flowers, textiles and handicrafts. Next, visit the adjacent Santo Tomás Church, where shamans have burned incense and candles in their rituals for 400 years. Walk up the 18 stairs that lead to the church, each signifying a month on the Mayan calendar, and learn about the combination of pre-Christian and Catholic beliefs and ceremonies of the Masheños (people of Chichicastenango). After your guided tour, continue to the town of Panajachel on Lake Atitlán (Lago de Atitlán), one of most beautiful places in the world! Isolated in the Guatemalan highlands, you’ll catch breathtaking views of three surrounding volcanoes. Get settled in at your accommodation and enjoy your free evening to do as you wish. Arise for breakfast with your group, and then take a scenic boat ride across Lake Atitlán to the indigenous village of Santiago Atitlán. On an inlet just south of Panajachel, Santiago lies between the Tolimán and San Pedro volcanoes. Have lunch at a local hotel and then tour the village with your guide. Admire the huipiles (tunics) that women weave and embroider with colored birds and flowers. You’ll pay an interesting visit to Maximón – a mixture of Mayan deity and Catholic saint. The wooden statue is paraded through town during Semana Santa and resides in a local family’s house the rest of the year, receiving offerings. After returning to Panajachel, you’ll head back to Guatemala City for the evening. At your hotel, dine on breakfast and then get ready for drop-off at the airport for your return flight.